Bathing Suits can be expensive. And swim suits are similar to lingerie in that you want to take extra-good care of them so they’ll last a long time. But how do you take good care of a bathing suit? How do you effectively wash it so it stays looking new all summer? Please don’t re-coil when you see the words ‘hand wash’ up there. This is going to be quick and simple. The goal of washing your swim suit is to remove as much of the chlorine and sunscreen as possible. If you’ve been swimming in a lake or ocean, you want to remove the salt and any other ickies that might be in the fabric. Pour 1-2 Tablespoons of detergent in a small plastic pan. 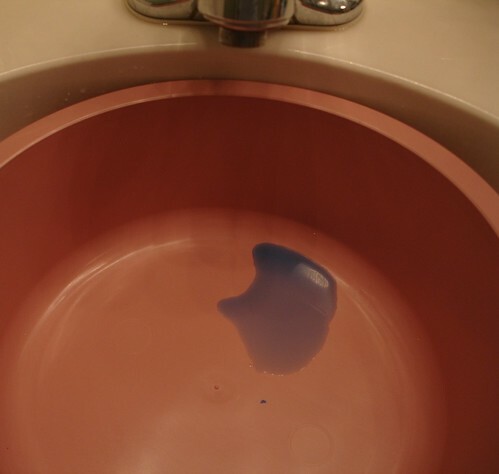 You can pour the detergent right in the sink if your stopper works well and the water doesn’t slowly leak out. Fill the pan mostly full with luke warm water. 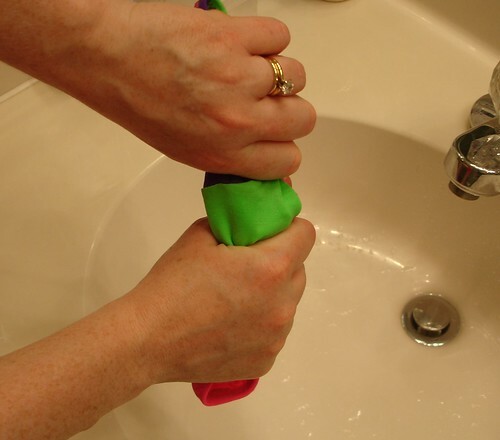 Swish the water around with your hands to dissolve the detergent and make it sudsy. Soak your bathing suit in the water for 30 minutes to an hour. Every 10 or 15 minutes, agitate the water and swish the swim suit around with your hands. After the suit has soaked awhile, use both hands to gently scrub the spots on the swim suit where sunscreen might be: the neckline, shoulder straps, etc. Now dump out the water in your pan or sink. 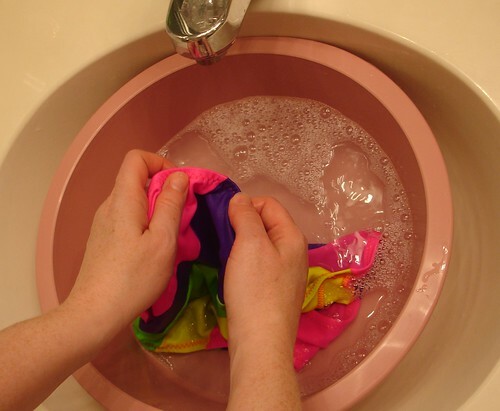 Using luke warm water, rinse the swim suit thoroughly under running water. You want to use a lot of water here to 1) remove the detergent and 2) remove any dirt, sunscreen, chlorine, or salt with it. You should rinse the bathing suit under running water until the water is clear and no obvious suds are left in the swim suit. Rinsing for 1-2 minutes under running water should be sufficient. Now squeeze the extra water from the bathing suit. Do not wring it like you would a dish cloth. That causes undue wear and tear. Let the suit drip dry while hanging in the shower or the laundry room. While I don’t recommend washing your bathing suit in the washing machine, it’s not always convenient to hand-wash your suit. 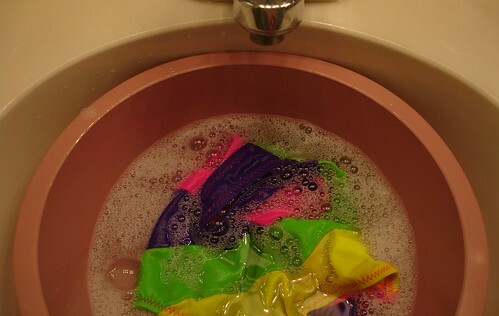 It’s okay to wash your swim suit on the gentle cycle on occasion but you should not routinely put it in the washer. Put the suit in a mesh bag. It’s okay to wash your bathing suit with other items, however don’t wash anything that would pick the fabric (items with zippers or velcro or anything rough on the fabric). Even a mesh bag won’t prevent every problem. 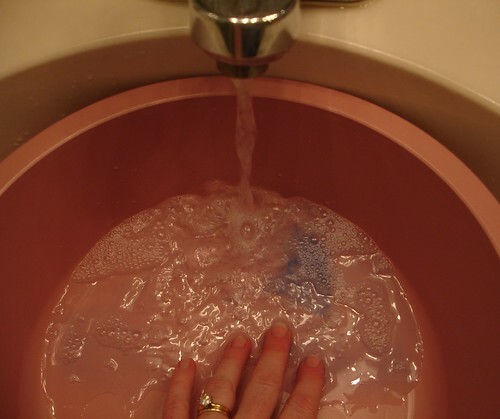 Set your machine to the gentle cycle, using cool water. After it has completed the wash cycle, hang the swim suit to dry on a hanger. Never ever dry your bathing suit in the dryer. It is a sure-fire way to make it look old before its time. It will ruin the elastic and can often make it lose its shape. In just a couple of runs through the dryer it will not fit the same. Don’t use bleach, Oxi Clean (or similar) or other stain-removal products. They can cause discoloration. If you wash your suit in the machine, do not use hot water. Again, it will ruin the elastic and the general look of the bathing suit. 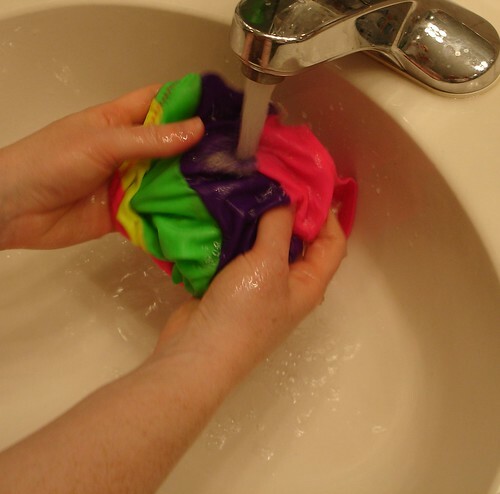 Every 4-5 washes you can use warm water, but do so infrequently. When drip drying your suit after hand washing, place a towel on the floor underneath the suit. It will drip a lot of water on the floor, depending on how well you squeeze out the excess water. You can roll the suit up in a towel and squeeze out the water for quickest drying results. Thank you for making hand-washing look do-able. I always resist it. I do run mine through the washer on occasion, but the main problem that I run into is that I forget it was in the load and accidentally dry it. One suit actually melted in the dryer and COULDN’T be worn again. Hi I bought my Daughter and me a few bathing suits at a thrift store some are a dark color some are light I was wanting to know how do you disinfect the bathing suits I didn’t know if you can use non chororine bleach for the darker colored suits can you please tell me what I can do??? ?